Gray. That sounds gloomy, I know, but when I scan my closet there are a lot of gray tanks and t-shirts. I guess I’m drawn to them because it’s an easy neutral for whether I’m feeling up or down. I love labradors. Gracie (our golden retriever) is beautiful and loving and sweetness personified, but still…there’s something about labradors. They’re smart, loyal, and remarkably kind hearted animals. I’ll preface with I’m not a gardener or even particularly attuned to landscaping but there are certain aesthetics I’m drawn to, and those would be: Sunflowers. Lily pads. Daffodils. Daisies. Wildflowers. 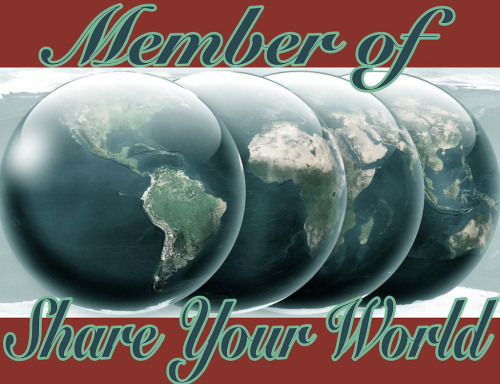 Cee’s Share Your World is a weekly Monday blog event. Check it out! I agree with you about labs. I have 1-1/2 – a white lab and a black lab/border collie mix, and they are my loves. Despite the amount of hair they deposit everywhere they go. My word, THE HAIR. It’s like growing an extra dog twice a week!! How is it they don’t go bald? I have zero ideas on that one. It’s not like I’m dosing her with Rogaine. Tee hee hee!